Here's another cleverly edited video that has been on line for a few years now. 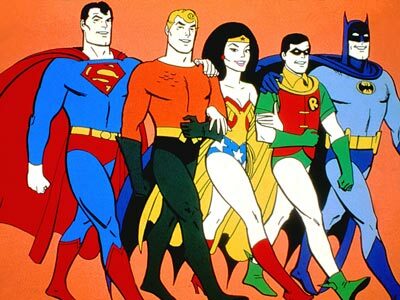 In the 1970s there was a Saturday morning cartoon show called Superfriends which featured the DC comic characters that are now better known as the main characters in the Justice League of America. They included Superman, Batman, Wonder Woman and Aquaman. The clip below uses video clips from the Superfriends cartoon with audio clips from the Friends TV show so Superman is voiced by Ross, Wonder Woman is voiced by Monica and so on. The funniest is who is voiced by Rachel.